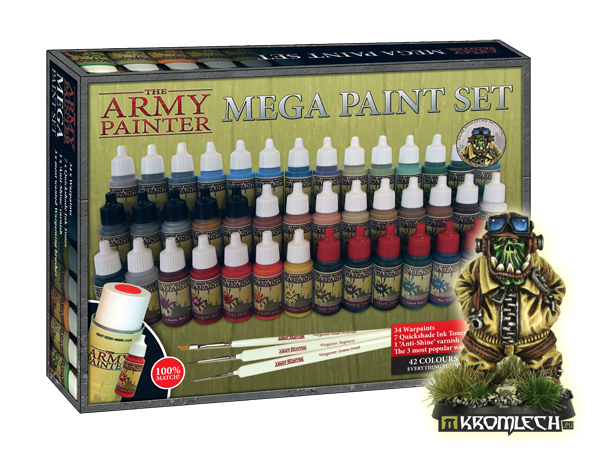 The Army Painter and Kromlech are teaming up to bring you a great test-model for when you get your spiffy, new paint sets. A rather limited number of sets of The Army Painter paint sets have a free Orc Pilot miniature inside. The boxes are marked, so you know if your set has the free figure in it or not. Check out your shop to see if they got any in. We have allied ourselves with the talented guys at Kromlech and an amazing resin Ork Pilot miniature will be inserted into all Mega Paint Sets and Starter Paint Sets this X-mas – absolutely free. Each box will receive a sticker to the front clearly indicating the miniature is included for FREE. Check out your local games store this Christmas and pick up a brand new paint set with benefits. Please note: we only have a restricted amount of amount of these Limited Edtion sets!